Do these little fellas look familiar? They're the mini version of my Funny Bunny cookies~so simple to make and no baking is required. You still have plenty of time before Easter to whip up a bunch! Did I mention how tasty these little pops are too? 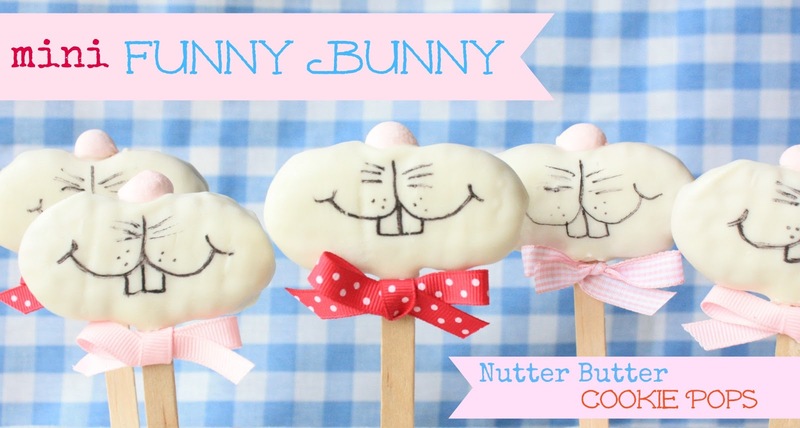 I always get such a kick out of the cute treats made from Nutter Butter cookies, that I bought a pack intending to make some sort of Easter treat, a bunny perhaps. I first held the cookie up vertically, but when I turned it sideways, I immediately “saw” a mini version of my Funny Bunny cookies. They turned out even better than I had imagined! They’re simple to make, and are sure to be a hit with kids and adults alike! Everything you need is in the photo above. Pink marshmallows (I had pink hearts left from Valentine’s Day), or pink jelly beans work too. 1. Melt the bark (in a deep bowl) according to package directions. 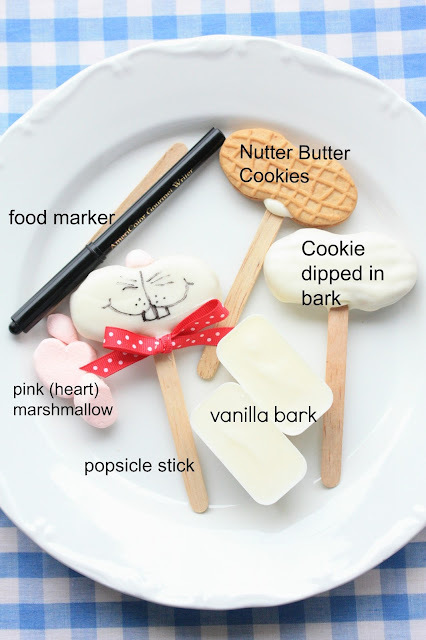 Dip the end of a popsicle stick into the melted bark and gently insert it into the middle of the Nutter Butter cookie (oriented horizontally). Push bottom of stick into styrofoam block and let dry (15 min. or so) before the next step. 2. Holding the end of the popsicle stick, dip the cookie into the melted bark until completely covered. Let the excess drip off into the bowl. 3. While it is still wet, gently add a small, pink marshmallow (you may cut it, to shape it into a more nose-like shape) or pink jelly bean onto the top, middle, curved part of the cookie. Another option is to let the cookie dry first, and add the nose with a dab of melted bark later. Let cookie dry completely. 4. After the cookie is dry, use a food marker and add simple, bunny facial features…mouth, teeth, whiskers. 5. Add a bow with a dab of melted bark, or tie a ribbon around the stick. These are so cute Sue! Really love the minis...would be cute for school parties! Grand Kids get in Thursday--we will make these on Friday! Thanks for another great idea. I do love your blog--it's my happy blog! These Funny Bunny are so cute. Definitely put a smile on my face...even after I had a long day today. :) My little girl is into anything with bunny! I'm sure she'll love these if I make some for her. Thanks for sharing. Loved these on Skip to My lou. They're as cute as ever. Adorable! One of the best ideas I've seen with Nutter Butters. Wondering why you don't allow "pinning"? Sure would like to add this to my collection of Easter pins....sorry you don't want to share it there. I allow pinning, Lexy:) I guess I just need to add a "pin it" button. I have pinned this post though, so for now you can click on the red Pinterest "P" at the top and it will take you there, to repin:) Sorry for the inconvenience! Thanks for such a great Pinterest Board also. Forgot to say thanks for such a cute idea. Adorable ... and just perfect for Easter! very cute sue!! I wish my kids could eat peanut butter, they'd love these. Maybe there is another cookie kinda that shape! Darling Sue! My kids are not big fans of peanut butter, but I think they would really like the milano cookie idea. Happy Easter to your family! Hi Sue!! Just saw you comment on another post and came to see you blog! We love it! These pops are so cute. Perfec for easter!!! Your creativity is truly amazing. You just can't help but smile when you see these!